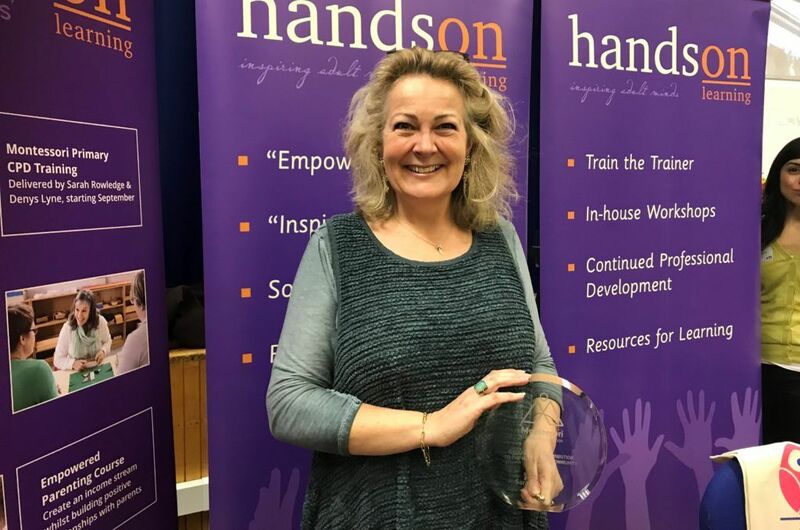 In recognition of almost 20 years dedication to early years and primary education, unerring peer support across the country, and simple exemplary practice, last week, our very own Sarah Rowledge received the prestigious Outstanding Contribution to the Montessori Community Award. And inspirational, she is. In the late 90s, Sarah became ‘hooked’ on the educational ethos of Maria Montessori; to inspire young minds and set the foundations for life-long learning, and by April 1999, she opened the doors of Absolute Angels Montessori Nursery. In 2008, Sarah went on to establish Soaring High Primary School, offering Montessori Education in the heart of Essex to children up to the age of 11, with a Montessori primary curriculum that fully meets the requirements of Ofsted and the National Curriculum and, in many subjects, goes well beyond. Sarah’s passion and expertise have been in constant demand, and back in 2005 she took on the challenge of managing and supporting the transition of a failing state primary school in Manchester, Gorton Mount, where she left her own thriving businesses and moved to Manchester for a year to train their teachers and establish what is now an outstanding Montessori-based primary academy.